I adapted this from a Café Fresh recipe. I had to adapt it because their recipe included seeds and when I went to the press, the seed box was almost empty. So I threw in muesli, flaked almonds and a mushed up Weetabix instead. Necessity. Mother. Invention etc etc. This recipe is sugar free – so good for you! I used a 12” x 9” oval ovenproof dish – a square one might work better for slicing. o Bake for 25 minutes, until golden-brown. 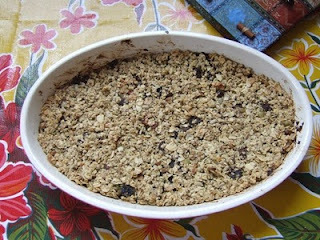 o Cool in the dish before slicing – it may be crumbly. Who cares? Have more!